North Belfast republican Mary Doyle was first sent to Armagh women’s jail for republican activities in May 1974 when she was 18 years old. “At that stage we had political status,” she told the West Belfast News. In 1975, while Doyle was in jail, her mother was murdered by the UVF. She was allowed out for 24 hours on compassionate parole to attend her mother’s funeral, then returned to the jail. “That was a very dark period for me, but the comradeship of the women got me through,” she said. In 1977 the republican women POWs in Armagh refused to do mandatory prison work in protest at the withdrawal of political status. In response to the no-work protest, the women were kept in their cells all day during work hours and were allowed out between 5.30pm and 8pm in the evening to eat, wash and exercise. Punishment for the work strike also included the loss of educational opportunities and remission. One visit a week was reduced to one visit a month. Strip searches were a key weapon used by the prison authorities throughout this period in an attempt to intimidate and humiliate the republican women. This process, condemned as a form of sexual assault by the state, involved women being thrown to the ground and beaten if they resisted. While the men in the H Blocks of Long Kesh prison had begun the blanket protest in protest at the British government’s criminalisation policy, refusing to wear the prison uniform, Armagh prisoners were allowed to wear their own clothes. The women wore IRA uniform items such as black polo neck shirts, black skirts and tights as a form of protest against criminalisation. “We would organise commemorations in the yard wearing our uniforms if a Volunteer was killed,” Doyle said. “In February 1980 a major raid was carried out on our cells by male and female screws. They moved us into two association rooms while they ransacked our cells. We didn’t have much but what we had – photographs, letters and personal items – they destroyed. “We then had to walk back to our cells through lines of male screws on either side who came out with all sorts of abuse. “We were locked up for 24 hours a day and denied access to toilet facilities. This went on for a few days and a small amount of cold food was thrown in now and then. We had a chamber pot in the cell and tried to empty it out under the door when it was full, but the screws brushed the waste back in. “Mairéad Farrell, who was our OC, was protesting strongly to the prison administration, demanding that we be allowed out of our cells for an hour a day, which was our human and legal right. “After a few days we were allowed out for an hour’s exercise, four at a time – but the toilet facilities remained locked. The republican prisoners were moved from B Wing to A Wing where they spent the summer of 1980. The men in the H Blocks had at this point been on the blanket and no wash protest for several years. “There was great communication between the H Blocks, Armagh and the republican movement outside,” Mary explained. “There were 30 republican women prisoners and we only got one visit each per month, so we made sure that a woman had a visit from the outside each day to keep up the communication. “The question of beginning a hunger strike began to be discussed, and was firmly opposed by the leadership on the outside. But for us and for the men in the H Blocks, we felt our situation was intolerable and we needed to try to force a change in our conditions. Doyle explained the process of deciding to volunteer for the hunger strike. “I thought long and hard about volunteering for the strike before I put my name forward. My main consideration was my family. My mother had been murdered, my father was unwell and I had two younger brothers. I was approaching my 25th birthday. “After a lot of consideration I took the decision to put my name forward. Seven men in the H Blocks began the hunger strike on October 27. On December 1, Mairéad Farrell, Mairéad Nugent and myself joined the hunger strike. “Telling my family was very difficult emotionally. 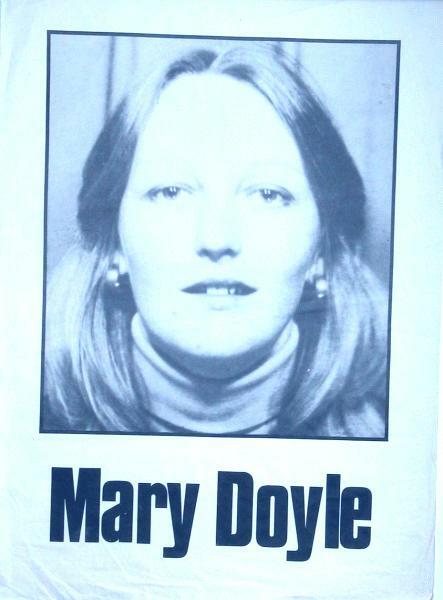 “When there had been talk on the outside of a hunger strike, my father had said to friends and family: ‘Oh, our Mary will definitely put her name forward.’ They supported me – that was amazing, to have the support of family, friends and comrades. Doyle noted that “prison food is notoriously bad” and said that Armagh was no exception. “The food was usually served cold and in small portions. But when we started the hunger strike, the screws would pass in plates overflowing with piping hot food,” she said. As the three women entered their second week on hunger strike, they were moved to the so-called hospital wing – a double cell in another part of the prison. They were allowed use the bath facilities, which was a requirement for everyone entering the hospital wing. “We had been on the no-wash protest since February that year and having a bath had been something we had been looking forward to so much, and talking about eagerly,” Doyle recalled. “But by that stage we were actually too weak to really appreciate it. “Communication with the other prisoners remained good as we were still allowed an hour’s exercise in the prison yard. But it was December and we were very conscious of the threat to our health from the cold, with our weakened immune systems. We wrapped up in extra blankets to try to keep warm. “Despite the physical hardship, our morale was brilliant. Our only concern was the health of our comrades in the H Blocks who had been on hunger strike longer than us. Then we heard that Sean McKenna’s health was rapidly deteriorating. “We had a small radio that we’d smuggled in to the cell that we listened to only at news time. On December 18 we heard an item on the nine o’clock news that said the hunger strike had ended. We thought we had misheard it but the same news was repeated the following hour. “Danny Morrison had tried to get in to visit us that evening to inform us of the decision to end the hunger strike but the prison authorities and NIO officials refused to allow him in. Mary recalled the rapid disillusionment in Armagh and the H Blocks as shortly after Christmas it became clear that the British had reneged on the agreement and had no intention of addressing the five demands. “In January we began discussing a second hunger strike. I was all for it. I put my name down again as did a few others,” she said. “My father had visited me after the hunger strike ended, and I will never forget the look of relief in his eyes. “I thought about what it would mean to put him and the rest of my family through that again. It was a very difficult decision, and something that I felt and still feel truly terrible about, but I felt I had to remove my name. “There were only 30 prisoners in our wing in Armagh jail, including some women who were not even part of the republican movement but who had been forced into signing confessions in Castlereagh. We made the assessment that we would not have the capacity to sustain a second hunger strike in Armagh. “When Bobby Sands started the second hunger strike in 1981, the no-wash protest was called off in the H Blocks and Armagh so the POWs could focus on the hunger strike. We were still on the no-work protest so we were still locked in our cells all day but managed to keep up communication in our time out of the cells in the evenings. She described the morning the Armagh women heard that Bobby had died. “There aren’t any words to properly describe the way I felt. It was every emotion at once – heartbreak, shock, fury and frustration – and all the time you were locked in a cell all day, not able to take any sort of action like protesting on the streets. “My heart ached for each of the families – the loss didn’t lessen as each of the 10 men died. The pain just grew and grew. “But the comradeship sustained us. When we had nothing else, we had each other. “Armagh jail was an old Victorian building. It was freezing. It wasn’t pleasant. The conditions when we were slopping out were grim and not something you thought you could ever get used to. Mary was released from jail in 1983 and has been involved in republican activism since then. She is currently standing as a candidate for Sinn Féin in the upcoming Belfast City Council elections, and works for the party in the Teach Carney constituency centre in North Belfast. She outlined the historic and current vital role of women in the republican struggle and the importance of acknowledging this contribution. “I’m very proud of my past and my actions as a Volunteer. I have no regrets – my only regret, if you can call it that, is that I was born into a sectarian Orange state. I’m proud of the progress that has been in dismantling the Orange state and the role that republicans have played in this. “The role that women have played, and continue to play, in the republican struggle is often not fully acknowledged. And it is not just women Volunteers, POWs or political activists that must be acknowledged, though of course these women have made enormous contributions. “It is women who have been the backbone of the republican struggle. They kept up the strength and morale of the community in the face of fierce repression. When husbands, fathers and children were arrested, women were left to run homes, to bring up children, to put food on the table, to organise visits to jail and to organise the protest movement in defence of the prisoners’ rights. “Women opened their homes to Volunteers to rest and eat. 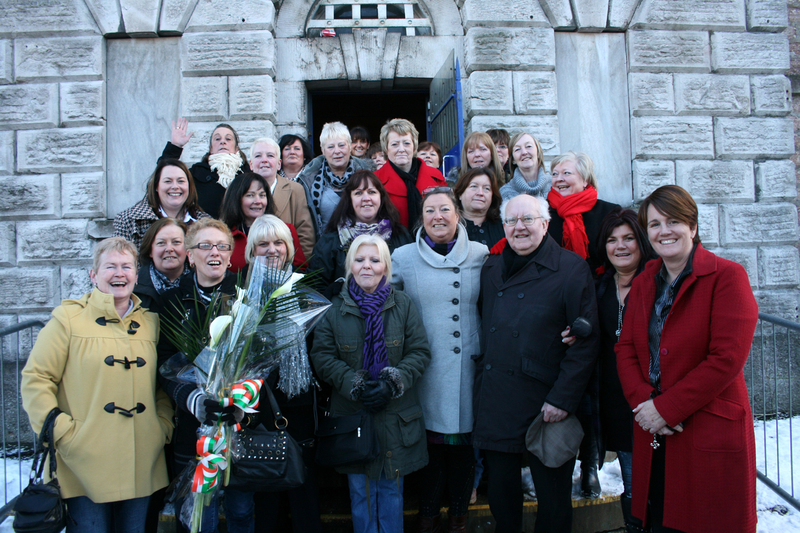 It was women, too, who drove the formation of the relatives’ action committees and the H Block/Armagh committees. I have absolute admiration for all of them. “We need to acknowledge this massive contribution in all its forms not only because it deserves to be acknowledged, but also because it helps to show women today that they have a full and active role to play in building the republican movement. Urging young people to participate in the series of commemorative events being held over the next year to mark the 30th anniversary of the hunger strikes, Mary said: “It is important that new generations learn about and understand this period in our history.